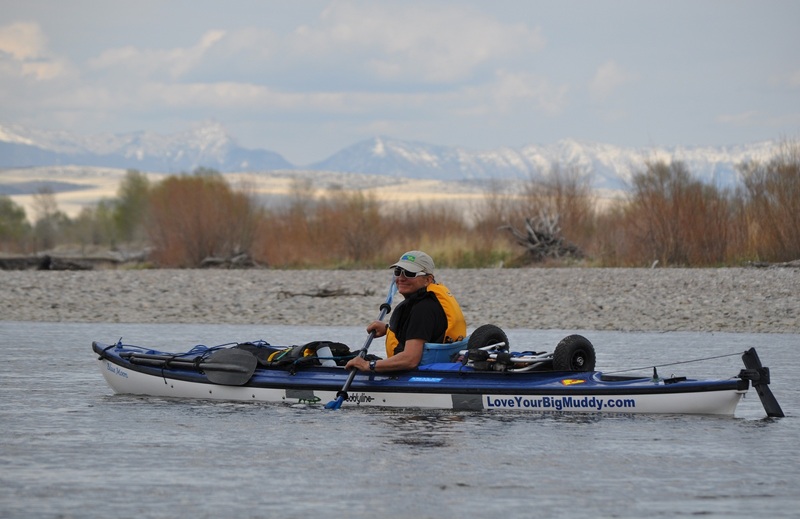 In 2014, we interviewed Janet Moreland — who had just retraced 2,600 miles of the journey of Lewis and Clark by kayak at the time — and wondered what she’s up to now… Here’s an update! I love the outdoors and strive to immerse myself in the natural environment whenever possible. I spent much of my youth in California’s Sierra Nevada Mountains ski mountaineering, and windsurfing the northern California rivers, bays and waves. I began canoeing rivers when I moved to Missouri in 1994, and started kayaking the Missouri River in 2001 after moving to Columbia, MO, in 1996. You can often find me three miles down the road from my house on or near the Missouri River at Mile 170, Cooper’s Landing, where I spend much of my time walking my dog, paddling, or enjoying the company of our large river community. One of the biggest motivating factors was the notion that I would be the first woman to paddle the entire length of the Missouri River solo. This turned out to be very inspiring for many people, following my expedition. Later, I realized I would also become the first American to journey from source to sea. Well, the journey is not over until the mission bears fruit. I am still actively working on realizing these goals. The first step in my trip was to complete the paddle successfully. Many who followed my trip on Facebook or on my blog were very inspired that a 56-year-old woman was attempting such a grand and challenging expedition. Also, I wanted to model for school-age children that they can overcome challenging obstacles and be successful in achieving their goals. Many of my students from last year were excited about my attempt, and followed me on social media. Regarding education, I tried to share as much of my experience on the river as I could, including some cultural and historical information. I wanted to increase awareness of Missouri River Relief, a dynamic non-profit organization dedicated to the stewardship of the Missouri River, as well as educating our youth and communities about the river, on the river. While I was on my expedition, River Relief was conducting river cleanup events on the river from St. Louis to Washington to Kansas City to Omaha. Numerous favorite locations I called home for a night, or two. One that sticks out was on the Mississippi River just below the Arkansas River confluence across from the Chicot City navigation light. I camped on a sandbar shelf, which positioned me up, and looking out, over a narrow bend in the river. I was protected from the north by a long hedge of willow trees. I love being up high, and I love having the tow and barges passing close by. The tow and barges have a romantic feel to me because I believe the pilots of these boats would be navigating the river in steamboats if they were living in that era. The river is their life, so I felt at home navigating amongst them. The fog on the river the next morning was exquisite and I managed to capture the moment with photography. Least favorite camp was on Fort Peck Lake in a low-lying cove with no trees and covered with mud. It was here that I experienced one of the several severe electrical storms on my trip. I bolted out of this site first thing in the morning, wallowing in mud. Ugh. Excerpts of interview reprinted with permission of Janet Moreland, special thanks to Adventure Kayak Magazine. For more details of Janet’s epic journeys see loveyourbigmuddy.com.